Your space craft touches down on the uncharted planet. In the distance, a craggy spine of mountains looms over a vast alien forest. No human has ever been here before; perhaps no one will ever come back. You are alone. 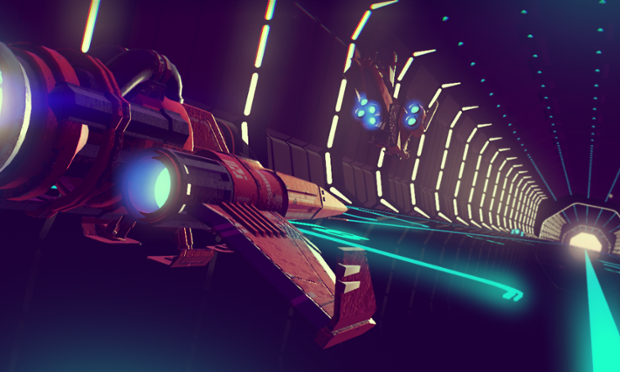 No Man’s Sky doesn’t work like other science-fiction adventures you may have played. There is no over-arching story, no grand scheme to funnel players through. Instead, it provides a vast universe filled with worlds that have been procedurally generated by computer algorithms, and it tells you to go out there and explore. You can fly your spaceship, land on any chunk of rock, get out and look around. Everything else, from here on in, is up to you. Somehow this is counter-intuitive to expectations in 2014. Although presented to the public on several occasions since it was revealed last year, very little is really known about No Man’s Sky. We know that it’s a persistent online universe inhabited by every player; we know participants will be able to gather resources from planets in order to buy new equipment and space craft. We know there are computer-controlled inhabitants – from creatures roaming planet surfaces to aliens piloting space craft – but nothing else is clear. Perhaps because there is nothing else. That is the point. What Murray laments is the way mainstream titles tend to restrict the gaming experience. “Games are obsessed with having no breathing space – they never let the player walk around and enjoy something,” he says. “With Call of Duty, it feels like they sit there with a stopwatch and if an explosion hasn’t gone off every 30 seconds, someone is fired. “I’m numb to it. I mean, games are amazing now, they’re beautiful. But you sit and watch something that looks glorious, and hundreds of people have worked on it, and you find yourself yawning. But Murray has a theory. Since Minecraft was first released in 2011, it has engendered a new era of game design – and gamer – that is more about player experience and creativity than it is about a drip-fed narrative. Right now, the players who are in to open-ended games like Minecraft, Terraria and Day Z represent a niche – but soon they will be the mainstream. But these new games do not just provide players with the freedom to explore, they also offer the freedom to be creative agents in the world. As well as building houses, it means experimenting with the environment and mechanics to produce their own game experiences. “So few games allow you to express yourself,” says Murray. “In the Call of Duty single-player story, I can’t express myself at all. They don’t want me to. They’re fighting me so hard – to the point where I just go around shooting everyone in the groin– it’s the only thing I can do to be expressive, to be funny within the game. And when you make choices in Mass effect it feels like it was agony for the designers to put that in there. Murray is keen to stress that No Man’s Sky will provide a familiar “core experience” to players. It has space combat, it has first-person shooter action on the planets; there is a structure that will guide players toward some sort of resolution at the centre of the galaxy. There are also hints of some sort of darker threat lurking out there in space. But everything will be more esoteric than many are used to now. The Hello Games team are all computer gaming veterans; they grew up playing weird obtuse adventures on the Commodore 64, Spectrum and Amstrad. In those days the possibilities were not always signposted for the player. It was all about discovery; you had to draw your own maps and figure things out. Minecraft has retained an element of this, on the PC at least, by not spelling out to players how everything has to be crafted. It has allowed the community to flourish through the sharing of arcane knowledge. For Murray, the places where mainstream games get closest to their more obtuse and demanding ancestors is in their hidden elements; their Easter eggs and secrets, the stuff put in for the real fans to discover and decipher. No Man’s Sky is that stuff stretched out again into a whole game. “The mythology that surrounds the yeti in GTA – we’re sort of making a game that is about that,” he says. “It should appeal to the people who that appeals to. This is slightly embarrassing, but we have a whole lore, a mythology mapped out, and every design decision we make, we make it with that in mind. “So choosing the insignia on ships or the type of architecture – if people lived on these types of planets, what kind of buildings would they have? How many different races are there? We have it all mapped up, but we won’t tell you any of it; and you probably won’t be able to figure it out. Maybe there is no goal; maybe the experience is the destination. That will be hard for some people to accept. But perhaps there is another way to think about No Man’s Sky. While big ambitious space games like Mass Effect and Star Citizen are perhaps looking to the likes of Star Trek and Star Wars, Hello Games is more closely referencing those weird, disoptian sci-fi films of the 60s and 70s: Silent Running, Solaris, 2001 – movies that explored the surreality and mysticism of space. “There’s a natural, almost horror element to all those films, where loneliness is something dangerous in itself,” says Murray. “That’s the feeling we want you to have all the time; that you are vulnerable and tiny in this universe.